Eating at Herbsaint when in New Orleans is such a no-brainer that it took me four visits over four years to do it. Now I’m mad at myself for waiting so long. It was a very satisfying experience. 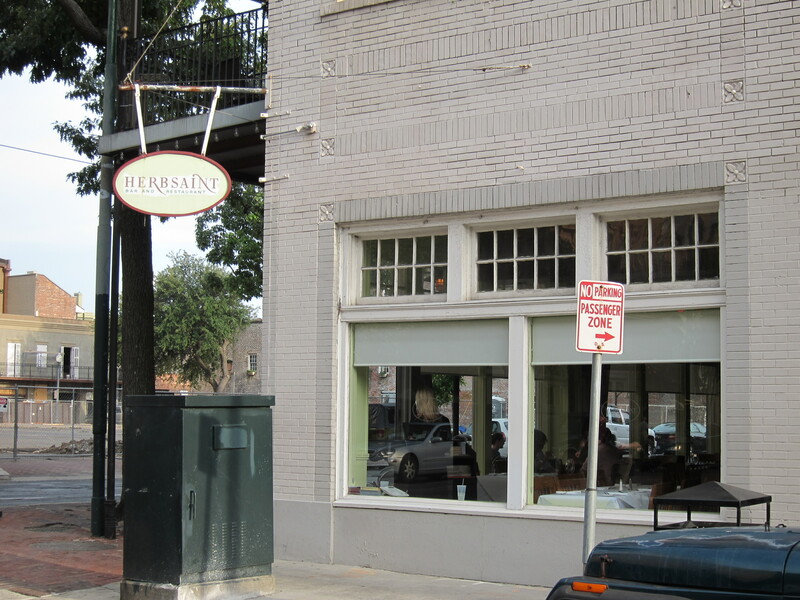 The server had me sit next to the big plate glass window looking onto St Charles Avenue. A group of four people sat around an outdoor table drinking wine. Six bottles of wine and four glasses covered the table top. At first I thought I had a ringside seat at a convention of lushes. Then I realized that this is what restaurant owners do when they want to entertain friends and taste wine. Donald Link, the owner and chef of Herbsaint, Cochon and other restaurants in New Orleans was enjoying the perks of owning a very fine dining establishment. More power to him. For my first course, I had a delicious cherry tomato and burrata salad with garlic toasts that actually would have been plenty for me. The dressing was light and tilted more to the flavor of the olive oil than any acid in the vinaigrette. Early July struck me as rather early for cherry tomatoes, but they were deep red and sweet. A plate of housemade spaghetti with guanciale and fried poached egg came next. Poised on top of a mound of spaghetti already drenched in a creamy sauce with bits of guanciale (like bacon) was a dark golden ball of friend bread crumbs. When I broke into it with my fork, a perfectly runny egg yolk oozed out. I mashed the ball into the spaghetti like a kid playing with my food. A bit on the rich side, but delicious. The carbonara sauce into which the runny yolk disappeared was flavored with a hint of Cajun pepper. It won’t be another five years before I return to Herbsaint. I will make it regular visits to one of the best places to eat in NOLA.